In the Trump Era, Is Canada’s Trade Relationship with the U.S. a Blessing or a Curse? 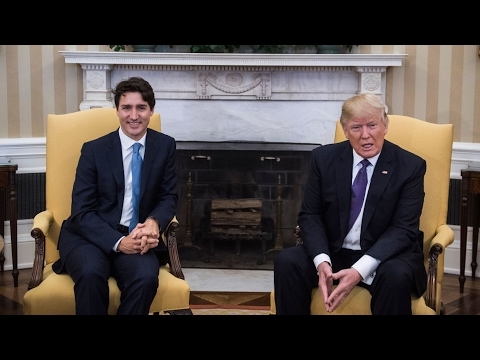 At the White House on Monday this week, Canadian Prime Minister Justin Trudeau, met with President Donald Trump, for the first time since the U.S. election. Before that meeting, President Trump had repeatedly pledged to renegotiate the North American Free Trade Agreement, linking the economies of the United States, Mexico and Canada, in order to make the terms more favorable for the American people. At a joint news conference with Prime Minister Trudeau, after the White House talks, President Trump said his biggest concern with NAFTA — the North American Free Trade Agreement — is the U.S. trade relationship with Mexico, which he has frequently accused of stealing U.S. jobs. Here’s some of what both Prime Minister Trudeau, and President Trump, had to say in their remarks after their meeting. DONALD TRUMP:	We understand that both of our countries are stronger, when we join forces in matters of international commerce. Having more jobs and trade right here in North America, is better for both the United States, and is also much better for Canada. We should coordinate closely — and we will coordinate closely — to protect jobs in our hemisphere, and keep wealth on our continent. JUSTIN TRUDEAU:	No other neighbors in the entire world are as fundamentally linked as we are. We’ve fought in conflict zones together, negotiated environmental treaties together, including 1991’s historic Air Quality Agreement. And we’ve entered into groundbreaking economic partnerships that have created good jobs, for both of our peoples. Canadians and Americans alike share a common history, as well as people-to-people ties that make us completely and totally integrated, our workers are connected by trade, transportation and cross-border commerce. Our communities rely on each other for security, stability and economic prosperity. DIMITRI LASCARIS:	All of this has left people wondering, and particularly people north of the border, what this means for the future of Canada-United States relations, and particularly the trade relationship. Here to discuss all of this with us today, is Nora Loreto, a freelance writer, and also the editor of the Canadian Association of Labor Media, who lives in Quebec City. Thank you very much for joining us, Nora. DIMITRI LASCARIS:	Nora, during the question and answer portion of Monday’s press conference, a Canadian journalist asked President Trump whether he believed that Canada was a fair trader. And the response that he made very clear, that he believed that the main source of the problems, as he perceives them under NAFTA, are in the Mexico-U.S. trade relationship, but not in the Canada-U.S. trade relationship. And he said that the most he had intended, for that relationship, was a tweaking of the agreement between Canada and the United States. But he didn’t get into any specifics. Based on the totality of the commentary coming out of the Trump administration to date, can we make any reasonable guesses about the Trump administration’s specific intentions, with respect to NAFTA, as it affects Canada? NORA LORETO:	I think, throughout this entire political show with Donald Trump, we have to look at his NAFTA comments, in context of the other comments that he’s made, in relation to immigrants, to Mexico and I think, to the border wall. Like NAFTA, like the border wall, it seems like it’s one policy for Mexico, and another policy for Canada. Which suggests that this is not at all about border security, or about a more fair free trade agreement, it’s about marginalizing Mexico. Now, we could guess why he might want to do that. I think the most obvious reason is just basic racism. I think that he has played up the threat, the xenophobic kind of mania that people have around immigrants. And in the United States, I think that it’s kind of a dog whistle to say, you know, “At our border,” that means Mexico. And so, as the details come out about what exactly was in NAFTA, is the Trump administration looking to fix? Well, it’s quite clear. It’s economic marginalization of Mexico, for either personal, ideological, xenophobic reasons, or pure political reasons, because it plays to the xenophobic, or racist elements within his supporters. So, we’ll have to see what actually does come out when NAFTA is open, and what those tweaks are. Because as a free trade agreement, it will be very difficult for there to be tweaks in Canada, and a whole scale reform, or scrapping it, with Mexico. That will necessarily mean fundamental changes to NAFTA. But from a Canadian perspective, I think that probably a lot of unions, and supporters… supporters of NAFTA, but unions who rely on the relationship with the United States — because a lot of companies that do business on both sides of the border, but who may also still be critical of NAFA — they might be breathing a sigh of relief. But for any progressive person who is concerned that racism is fuelling these trade… the decisions being made by the Trump administration on trade, I think we have a green light saying, it’s true, this is pretty much all based on race. DIMITRI LASCARIS:	Now, Canada, by far, its most important trading partner is the United States. No other state comes even close. And yesterday… and on Monday, not surprisingly, Prime Minister Trudeau repeatedly stressed the interdependence of the two economies, and he referred to them as, “Completely and totally integrated.” And there’s been a great deal of angst, of course, up here, about the intentions of the Trump administration, with respect to the trade relationship. Given in particular, his hostile commentary towards trade agreements. One would think that a logical, rational and prudent response on behalf of the political establishment in this country — in light of the obvious vulnerability that Canada’s economy has to an administration like that of President Trump — would be, to talk about ways to render our economy less interdependent with the United States, and less vulnerable to the kinds of politics that we’re seeing come out of the Trump administration. Is that a conversation that’s even taking place in Canada, at the level of the political establishment? And is it a conversation that can realistically happen? And if so, what steps, concrete steps, could the government take to render our economy less dependent upon the U.S. economy? NORA LORETO:	The problem is that 30 years of vicious neo-liberal assault on our political economy, has meant that the only solution to less integration with the United States, is being offered by the political class, most notably by the Conservatives, but also aligned to a bit the Liberals, is to seek out free trade agreements with other regions, and other countries around the world. So, rather than trying to figure out how to perhaps strengthen national economies, do we need to start talking about nationalization? Do we need to start talking about better ways that we can use the profits that are being generated within Canada, within, you know, like the banking system, for example? There are no conversations like that. Instead, we are being told that the solution to our economic woes, especially being so deeply integrated with the United States, is to instead broaden free trade markets around the world. Effectively decimating industries in Canada, like the dairy industry, or the poultry industry. Where this gets really difficult, is that we have totally lost our ability to imagine what a Canadian economy should look like. Like, there is no viable progressive options being put forward, and part of the reason for that is, we’ve got an NDP that is effectively… well, impotent right now. It has no real ability to make any kind of powerful statements, or influence political discussion. But we also have a Liberal party that is all talk, out of the left side of their mouth, and all action, on the right side of the political sphere. And so, what that means is, that the Liberals will say whatever they need to say, to curry favor from Canadians who, you know, generally are a more progressive-minded population than perhaps the Conservatives wish they were, while at the same time not acting on any of that progressive rhetoric. And I think that this meeting with Trump is such an excellent example of this. Where the so-called feminist prime minister, uses women in business as the cover for a meeting with someone who is broadly accepted to be a sexual predator, a sexual assaulter, a sexual harass… Whatever you want to say, but certainly someone who is not a feminist. And so, if we think about what that means for trade, you know, while the argument that going to other free trade agreements with other countries, or other regions, is a way to de-integrate ourselves with the United States, I suspect that we’re going to see further integration with the United States. Regardless of whether or not the political climate in the United States is getting stronger, or is even a place where Canadian businesses want to be right now. DIMITRI LASCARIS:	Yeah, and I think you’re referring to an initiative, that was one of the things, I think you’re referring to in your commentary, is an initiative that was announced with much fanfare on Monday, between Canada and the United States, the two governments, to promote female entrepreneurship. It was hard not to come away, those of us who are a bit more cynical, come away from that announcement with the impression that Prime Minister Trudeau in a way, is happily making himself Trump’s useful idiot. To burnish Trump’s much maligned, and fully justified, reputation as a misogynist. And I think that’s what you’re referring to, if I’m not mistaken, right? NORA LORETO:	Yeah, it’s not. It wasn’t just that, to kind of obscure the sins of Trump, or the Trump administration. But that was also used as a way to try and obscure what other agreements came out of the joint letter, between the American administration and the Canadian administration. So, you know, Canadian journalists really focused on the handshake, and really focused on the aesthetics of the meeting, and the Women’s Business Council, kind of announcement. There wasn’t much attention to the fact that the letter referenced the Keystone XL Pipeline. We know that pipeline projects are going to go ahead under Trump, and under Trudeau. But Trudeau needs to maintain an image of being progressive, especially when it comes to the environment. There were other environmental references made in the letter, too, that didn’t really get much coverage. Like protecting our water, and protecting our air, in the Great Lakes region. Which is laughable, when you think about the policies that the Trump administration is hoping to realize, like, bringing back coal, threats to the EPA. And then there are also some signals saying that Canadians really should be afraid about what the Liberals are willing to give to the Trump administration, in terms of our security. And so, there was a reference to stopping opium imports. That has been commonly talked about in Canada, as giving border services agencies the right to open letter mail, because they say that a lot of opium imports are coming through the letter mail. So, all of a sudden under the guise of protecting Canadians from the opioid epidemic, are we going to see a Liberal government green light a policy to allow our letter mail to be opened, pre-clearance for travelers, and allowing Canadian citizens to be detained by American authorities on Canadian soil? DIMITRI LASCARIS:	You mentioned the environment. I listened to that press conference in its entirety, twice, and I did not hear the phrase, “climate change”, mentioned once. Most disappointingly, even by the media, despite the fact that Trump is a well-known climate change denialist. But there was also another subject, and I think you’ve touched upon it, that was studiously avoided. Several weeks ago there was a horrific massacre at a mosque in Quebec City, where you live, and the alleged killer appears to have been a far-right Islamophobe, who was a fan of President Trump. Now, cross-border travel came up again, and again, in the press conference, so too did immigration. But there was no explicit reference to the highly controversial, and potentially unconstitutional, travel ban, imposed by President Trump on seven predominantly Muslim states. Nor was there any reference to Islamophobia. And in fact, Prime Minister Trudeau said, that it is not up to Canada’s government to lecture other states on how to govern themselves. Do you think that Prime Minister Trudeau is right in that regard? Do you think that comment was a correct view of the relationship between Canada and the United States? Do you think he should have raised Islamophobia, that he should have said something explicitly and directly, about President Trump’s highly controversial travel ban? Or do you think that that was something that was not his place to do? NORA LORETO:	Well, that comment doesn’t even reflect Trudeau’s own opinion, right? When he visited with the Chinese government, and the Chinese authorities, he insisted to the Canadian media that Canada would raise our concerns with human rights in China. So, you know, this is, again, going back to the all-talk reality of this administration. Look, the Muslim travel ban has already affected Canadians. We know this. We know that there are Canadians who’ve been detained, or denied at the border, Canadians born in Canada, but who are Muslim, and who have been denied access to the United States. Should Justin Trudeau have raised Islamophobia? I think he should have. More conservative elements of the commentary in Canada might say that that may be a little bit too much to ask, considering Donald Trump didn’t even acknowledge the role that Islamophobia played in the attack on six Muslim men, just kilometers from where I am right now. But one of the things that I thought was fascinating in the letter, so, not talking about Islamophobia, not talking about the Muslim ban — but they did make a reference to something that they called, “legitimate cross-border trade and travel”. And so the Canadian government is playing right into the rhetorical frame of the Trump administration, by talking about so-called legitimate travel. What is “legitimate travel”? Other than a dog whistle to say, that we tacitly support the sovereignty of the United States, to figure out who is, and who is not, a legitimate traveler. There is a context in which these words fit, and in my mind, it seems pretty clear that the Canadian government tacitly agreed to allow the things unsaid, to support what is effectively, an Islamophobic and racist immigration policy. DIMITRI LASCARIS:	Well, Nora, I hope that we’ll have many opportunities to continue this discussion, because undoubtedly we’re in the early stages of this relationship, and it has the potential to have dramatic impact. As I’m sure, you know all too well, on the living standard of Canadians, and also, the civil liberties of Canadians. I thank you for joining us.